World War II was home to countless tragedies, from the surprise attack on Pearl Harbor to the devastation of the Holocaust. 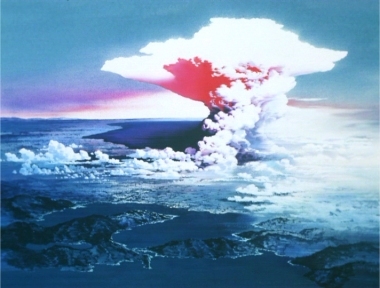 The bombings of Hiroshima and Nagasaki were the last major catastrophes of the war, as roughly 200,000 Japanese civilians lost their lives after the U.S. dropped an atomic bomb on each city. As with other acts of extreme violence, the destruction ended both individual lives and relationships created by families and friends. In many cases, orphaned children were left to fend for themselves; while those lucky enough to survive have grown up to have children of their own, their stories of survival are still important. The re-telling of these stories has allowed them to not only deal with their losses, but to inform those who didn't witness the destruction firsthand. Barefoot Gen is one such story. Originally published as a manga series by Keiji Nakazawa (featured in the Japanese publication Weekly Shonen Jump in 1973), this semi-autobiographical tale reveals what it was like to live through that terrible event and the countless years it took to recover. 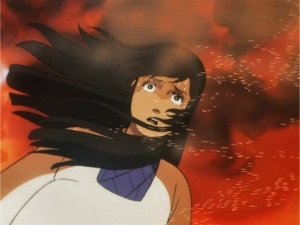 The story was adapted into a pair of animated films in the mid 1980s; though both are critically acclaimed, they remain relatively obscure outside of anime circles. Having been familiar with the author's life story but unfamiliar with the actual manga or anime adaptations, the films can still surprise those who know "the ending". They may be unsophisticated in the visual department, but Barefoot Gen 1 & 2 are both striking on their own terms; while they undoubtedly skip many details for obvious reasons, the main facts are front and center. On August 6th, 1945, an atomic bomb was dropped on Keiji Nakazawa's hometown and his life was changed forever. Summaries and brief comments about both films are provided below, though a few minor spoilers are revealed in the opening paragraphs. If you're already interested in the films and wish to remain in the dark, skip directly to the "Quality Control Department" for the actual DVD review. Barefoot Gen (Hadashi no Gen, 1983) introduces us to the six-year old Gen and his family, struggling to make ends meet during World War II. His father is an outsider with strong anti-war convictions; likewise, the family more or less follows suit. After the tragic nuclear blast---punctuated by a startling, graphic sequence of destruction and death---his brother, sister and father are killed in the resulting fire, leaving Gen (above right) and his pregnant mother (above left) to fend for themselves. As they walk among the dead and dying, Gen remains optimistic even as further tragedy strikes. If nothing else, it's a somber but encouraging reminder that life's most difficult twists can still be overcome. Though it's hard to criticize films that deal with horrific human tragedy, Barefoot Gen still suffers from a few heavy-handed moments that weaken the overall experience (see also Schindler's List). The "unpatriotic" nature of Gen's father is well executed---especially early on, when we see his silent disdain of the enthusiastic military---yet a few of his subsequent speeches are a bit too over-the-top. The atomic bomb sequence is surprisingly effective, yet would've been even more powerful if we hadn't seen a pointless flashback of a murdered young girl earlier on. As Gen and his mother travel through the city, their encounters with the dead and dying population are affecting but occasionally overbearing. An encounter with a young mother who's recently lost her daughter is almost frustrating: we understand she's been through so much, but her violent outburst---and immediate change of heart, not thirty seconds later---creates a convenient "feel good" moment that doesn't quite work. For the most part, though, Barefoot Gen succeeds on a number of levels. Though the visuals are closer to an animated series than an epic film, the images will be burnt in the viewer's memory. 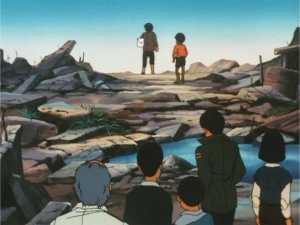 We can't help but compare it to the later Grave of the Fireflies (1987), if only for the subject matter and young perspective; though Barefoot Gen is a less polished production, it's supported by a more urgent and dramatic story. Hiroshima was a horrible tragedy; if nothing else, the film's optimistic overtones manage to soften the blow. Though I've not yet read the original manga, one can only assume it goes into much greater detail about the author's difficult childhood. 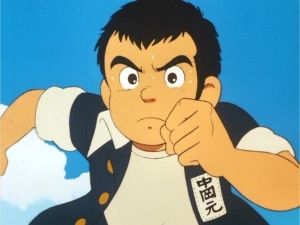 Barefoot Gen 2 (Hadashi no Gen 2, 1986) is the animated follow-up to the original and takes place some three years later. Gen's life experiences have made him more mature, so the story is naturally told from a more even-handed perspective. Together with his adopted brother (above left), their days are spent in a dilapidated classroom; when not in school, they're trying hard to earn money for their mother. The young boys eventually fall in with a group of orphans who deftly avoid detention centers, including the rebellious Masashi and the quiet, reserved Katsuko. Together, they all build a small house for the group to live in, even inviting a despondent former journalist to join the club. The brothers' enthusiasm is sparked by a grim prognosis for their ailing mother, who continues to work despite showing symptoms of radiation poisoning. Among other things, Barefoot Gen simply continues the story of innocents growing up during troubled times. I may be in the minority, but I slightly prefer this second chapter to the hard-hitting original. Though it doesn't have a specific event to set things in motion---aside from brief flashbacks to the bombing, of course---Barefoot Gen 2 is a confident, understated tale that feels slightly more genuine. A few scenes border on heavy-handedness, but this second chapter walks the line with greater ease, allowing the poignancy of certain events to feel more affecting. Though the film's deliberate pacing and less urgent plotline don't scream for attention, it remains a solid coming-of-age tale that stands in fine contrast with the original. Both have their strengths and slight weaknesses, but they're a more potent combination when taken as a whole. The DVD presentation by Geneon collects the two 80-odd minute films on one single-sided disc, blessing both with a solid technical presentation but skimping on the bonus features. As a value package, though, it can't be beat; especially considering the first film has been long out of print on DVD. All things considered, those who don't mind a good tear-jerker sprinkled with optimism should find Barefoot 1 & 2 a heavy but worthwhile viewing experience. 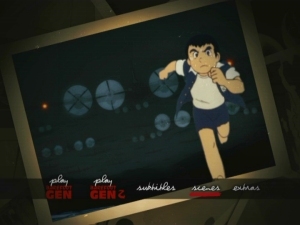 Presented in their original 1.33:1 aspect ratios, Barefoot Gen 1 & 2 look to be in excellent condition overall. Though I don't own the previous DVD releases, these transfers look very clean and smooth with a subdued but natural color palette; additionally, no digital problems were detected along the way, including pixellation and combing. The audio for both films is presented in Japanese Dolby Digital 2.0; thankfully, disc space wasn't wasted on an English dub. Optional English subtitles of varying colors are included during the main features: yellow for dialogue, green for lyrics and white for on-screen text. Seen above, the moody, sepia-toned menu designs capture the films' somber moments perfectly. The 83 and 85-minute main features have been divided into 13 chapters each, while no apparent layer change was detected during playback. This single-disc release is housed in a standard black keepcase and includes a one-sheet chapter insert for both films. Though it's great to have both films on one disc, it doesn't leave much room for extras. 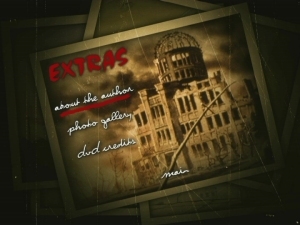 A three-page Text Biography is included for Nakazawa, as well as a brief Photo Gallery of several important Hiroshima landmarks. A subtitled audio commentary or interview with members of the creative would've been most welcome, but at least the films stand fairly well on their own. 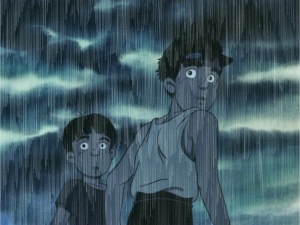 They're not exactly light afternoon viewing, but both installments of Barefoot Gen show us that tragedy doesn't always have to stop us dead in our tracks. When viewed together, they stand in stark contrast despite their many similarities; one is stirring but slightly uneven, the other is more balanced but less urgent. Regardless of drawbacks, both Barefoot Gen 1 & 2 are much more potent when seen as a divided but complete experience: taken straight from the life of author Keiji Nakazawa, they're incredibly heartbreaking and uplifting all at once. The DVD presentation from Geneon squeezes both films comfortably on one disc, favoring a strong technical presentation over bonus features (though maybe one day, we'll get both). Newcomers and casual fans may want to rent this collection first, but there's certainly enough here to make Barefoot Gen 1 & 2 worth owning. Recommended.